30 Days of Paleo: Complete! So I haven’t posted in about two weeks, which feels like forever, due to a crazy whirlwind of school and work and friend/family events. I finished my 30 days of paleo on Oct. 6 and wanted to share my opinions about it. Pros: I felt great and had a lot of energy. Obviously I felt this most in the first week or so, since my body was all excited that I wasn’t eating dairy or sugar. I also thought it was a relatively easy thing to follow even when eating out; as long as you can get steak/chicken/fish with veggies, you’re good! It’s not a diet that leaves you forced to get a salad. There were also so many great resources for recipes, so I was able to make a lot of paleo-friendly dinners, desserts, and breakfasts. I also looked much more closely at food labels, and feel like I became more aware of sources of hidden sugars! Cons: Not sustainable, for me at least. Being a nutrition fanatic, I know that there are a lot of benefits to eating healthy dairy and grains, like yogurt, brown rice, etc. Obviously cutting these out helps you lose weight fast, but I felt like I was missing out on a lot of nutrients. It also was expensive; since it’s mostly meat and veggies, you have to buy a lot of those, as well as nuts, paleo flours (almond and coconut flours), etc. I missed being able to make healthy pasta and rice dishes that made a lot more food for a lot less money! Family/friend gatherings were also hard, since they usually had a lot of un-paleo (but delicious) snacks. Overall, it was fun to try a new way of eating that wasn’t all about low-calorie or low-carbs. Paleo encourages lots of healthy fats and meat, which I love! But for me, it’s just not something I can sustain in the long run. I did, however, find some new recipes that I enjoyed and will try to incorporate some paleo meals here and there! 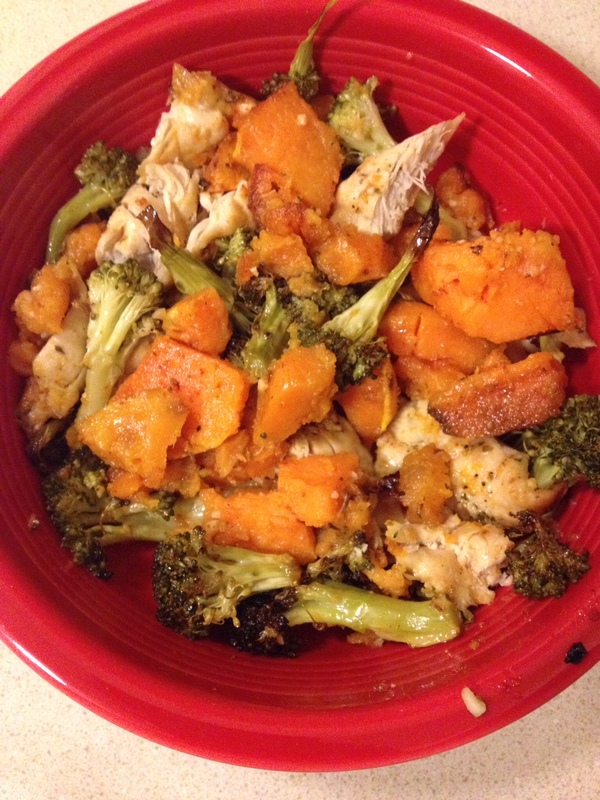 For my last paleo meal, I made this simple but delicious meal of broccoli, chicken, garlic, and sweet potato, drizzled with olive oil and baked. Easy but yummy!